Staying up to date with the current residential market trends is an excellent way to know when the best time to buy is. Comparing past housing prices with current ones can help homebuyers predict where the market prices are going to head in the future. To help you get started, your local Hamilton and Grimsby mortgage broker with Canadian Mortgage Authority has listed the most current market update for the Grimsby and Hamilton area. According to the Realtors Association of Hamilton and Burlington (RAHB), the residential listings has drastically changed from June 2018 to June 2017. For the entire residential area, there were 19.3% fewer homes listed in June 2018 (2,095 homes), compared to June 2017 (2,779 homes). The number of homes sold also decreased from 1,465 units sold in 2017, to 1,257 units sold in 2018. The average sale price has also decreased from the previous year. In June 2017, the average sale price was listed at $569,819 and dropped 3.5% to $549,906. With this recent decline in the market, now would be a great time to obtain a Hamilton mortgage before the rates rise back up. More specifically, the number of listings for freehold homes in Hamilton has dropped 19.8% from June 2017 to June 2018. In 2017, the units listed were 2,203 and decreased to 1,767 by 2018. The average sale price of homes also decreased from $597,963 in 2017 to $582,615 one year later. For condominiums, the units listed for sale decreased 16.8%, from 394 units in June 2017 to 328 units by 2018. The average sale price also decreased from $419,823 in June 2017, to $407,741 by June 2018. Regardless if you are wanting a freehold house or a condominium, now would be an excellent time to buy due to the recent decline in prices. RAHB states the opposite effect happening for the surrounding Grimsby area. In June 2017, the number of sales were 39 units and rose 43.6% to 56 units by June 2018. The average sale price also increased compared to the previous year. In June 2017 the average sale price was $518,978 and increased 11.6% to $579,403 by June 2018. If you are looking for a Grimsby mortgage, we recommend locking in a rate now with your local mortgage broker before the rates get more expensive. 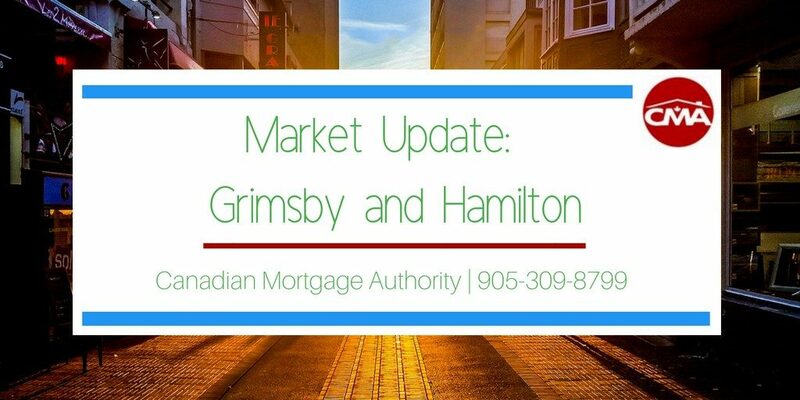 For more information on the Grimsby and Hamilton market update, or to get started on your mortgage application today, please contact the Canadian Mortgage Authority team at 905-309-8799 or visit our website today https://canadianmortgageauthority.com/.